Info "Cats don't really have nine lives, so help me cross safely." Cat Walk is one of Mona's microgames from WarioWare: Twisted! 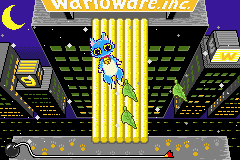 The player controls a cat as it crosses a wooden bridge from the roof of WarioWare, Inc. to another ten-story building. The player must tilt the Game Boy Advance to control the cat's balance as it is walking across the bridge and prevent the cat from falling. If the player wins, a spotlight shines on the cat while he applauds himself. 1st level difficulty: The kitten has seven rows of wood to walk across. 2nd level difficulty: The kitten has four rows to walk across. 3rd level difficulty: The kitten has two rows to walk across. This page was last edited on September 19, 2018, at 20:50.